Thanks to a friend of mine, I have 10 different flavors of Tirol chocolates to review soon! It's a favorite brand of ours, and she often sends me new flavors when she finds them. In preparation, I thought I should post the Tirol review I've been stewing on for a while before I dig into the various new flavors. 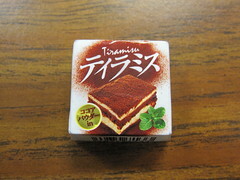 I don't really go nuts for tiramisu, but since I enjoyed the Tiramisu KitKat that came out a few years ago, I thought I'd take a chance on Tirol's offering. The chocolate smelled a bit like cheese (though I was reminded more of cheddar than mascarpone), and the layers were quite pretty. The cocoa powder layer was a nice touch, especially once the piece was broken. 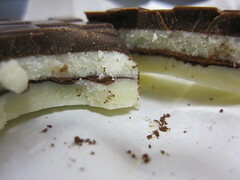 The chocolate seemed very soft, and you can see in the picture that it didn't have a clean snap. The rich chocolate had a slightly bitter coffee flavor with a tempered sweetness and not much in the way of cheese. All of the flavors seemed muted, and while it wasn't bad, it was a bit disappointing. To be honest, I think I would have liked it more if I hadn't just tried the Tiramisu piece in the LOOK Italian Dolce set. Teaser: it was so good that it may have affected my opinion. Orchid64 also reviewed this flavor on Japanese Snack Reviews. OMG! 10?! Really. That's so awesome! I'm jealous! I wish I could get individual Tirols here. They always have it in packs and there's almost always at least one flavor I don't want. I'm so excited about the Tirol! I can't believe my friend fit it all in one box. Hope you find some great new snacks on your next trip to Japantown! I'm jealous that you live close to a good source of Japanese candy!